Photo: Wikimedia Commons. 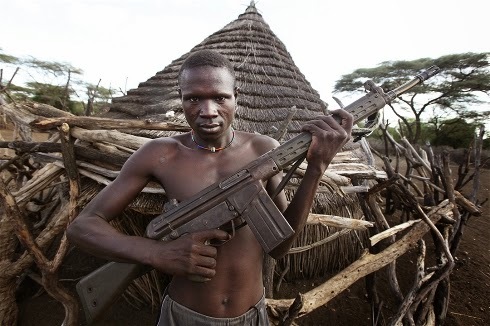 The conflict in South Sudan has been ongoing since mid-December. NAIROBI, 23 June 2014 (IRIN) - The northeast African regional Intergovernmental Authority on Development (IGAD) has been working to get the opposing sides in South Sudan to implement multiple ceasefire and peace process commitments to try to end the crisis in South Sudan, but fighting has continued with little progress towards ending the impasse. Meanwhile, beyond such international efforts, the South Sudanese are trying to organize their own reconciliation conversations, and independent grassroots efforts have sprung up. In April, church groups and civil society organizations came together to create the National Platform for Peace and Reconciliation (NPPR), an independent body seeking “to form a united platform to work for peace and reconciliation in South Sudan”. Since its launch, the organization has attempted to reach out to key stakeholders in the mediation process such as the government, opposition and IGAD team in Addis Ababa. They have also worked with local media, and joined forces with other civil society groups. The other two organizations in NPPR are the South Sudan Peace and Reconciliation Commission (SSPRC) and the National Legislative Assembly (South Sudan’s parliament) Specialized Committee on Peace and Reconciliation (SCPR). “Each [group] brings their own strengths to the platform and their combined mandates, capacities and distinct roles and responsibilities provide the basis for a viable platform through which to promote national peace and reconciliation efforts,” said David Okwier Akway, chairperson of the parliament’s SCPR. In South Sudan, the churches play a powerful role, and their involvement in a peace platform is crucial. Throughout the decades-long civil war, they were at times the only stable institutions and as such, have legitimacy with many, especially in more remote areas of the country. During the signing of the 9 May Peace Agreement, Kiir and Machar “initially refused to shake hands during the peace negotiations and it was a bishop who eventually managed to line them up and make them hold hands during a prayer for peace,” said Erik Solheim, chair of the OECD Development Assistance Committee, and former Norwegian minister of environment and international development. While national peace efforts generally have a greater understanding of the complexities of the crisis and therefore focus on more long-term solutions, it is clear that the IGAD-brokered talks are so far falling short. On 10 June, both leaders recommitted to ending the conflict and creating a transitional government of national unity within 60 days. IGAD warned both sides that member states “will take further collective action to pressure any party who fails to honour its commitments to date” noting that this could happen “through imposition of punitive measures”. But, a fresh round of talks slated to start on 16 June was postponed after the opposition boycotted the event. “The problem with the IGAD process for many of us is that it will only lead to an elite solution, unable and unwilling, I fear, to deal with the underlying causes,” said Michael Comerford, adviser to the CNHPR. NPPR was created on the understanding that there is more to the South Sudan crisis than just a conflict between the two principals, and as such, according to their mandate, they will consult with “a wide set of stakeholders and interest groups” over the coming months. “The main argument for an inclusive peace process is to prevent potential spoilers from destroying the peace outcomes,” said Nhial Tiitmamer and Abraham Awolich of the Sudd Institute, in a paper in February. They called for civil society, women and youth groups, and community to community initiatives to be included within the peace process in order to get a wide range of perspectives. It is also unclear how neutral regional governments are. Uganda, Ethiopia, Sudan and Kenya all appear to have taken positions in the conflict, and have strong interests in the outcome of the crisis. “The crisis has added a new dimension to existing tensions in the region - between Uganda and Sudan on one hand, and Ethiopia and Eritrea on the other,” said Berouk Mesfin, senior researcher at the Institute for Security Studies (ISS) Africa. “Every day the crisis continues, additional pressure is placed on these states that have, for some time now, been locked in a distrustful and suspicious relationship to support one side or the other. These types of deals are unlikely to be perceived as legitimate, or engender any sense of goodwill and forgiveness between the warring parties. He also believes that the government views the NPPR as threatening “because it is likely to carry a stronger voice of the people of South Sudan” and will be a body that, once hostilities have ended “will question the people in authority and seek for justice and accountability”. “While I am not party to the calculations made with regard to who should be included in the current talks in Addis, armed actors appear to have secured an automatic right to be there, while non-violent actors have to wait to be invited,” he added. Indeed, when boycotting the continuation of peace talks on 16 June, the opposition said they would not attend because civil society representatives nominated to the negotiations were done through “a faulty process”. A report from the US Institute for Peace (USIP) shows that, under certain specific conditions, local dialogue and small peace talks between groups can be very effective. If the agenda is limited, if the right people are in the room and are empowered, if the process is transparent and agreements and implementation mechanisms are drafted, and if there is a way to monitor results, war-torn states can use local processes to create stability. There have been previous precedents for local peace initiatives in South Sudan. In May 2012, the Presidential Committee for Peace, Reconciliation and Tolerance in Jonglei State managed to negotiate and sign a peace agreement between the chiefs of all six communities in the area. They came painfully close to creating a stable Jonglei, but for the actions of David Yau Yau, whose insurrection against the government of South Sudan led the state back into violence. The inability of the government to cement the peace deal with meaningful development assistance and foster genuine reconciliation ultimately led to the collapse of the 2012 agreement. But it provides an illustration that there may be viable alternatives to IGAD processes, which for now are faltering.